Why The Big Chill made me hot under the collar. You probably have heard during the past dozen years of the “Ocean Conveyor” and how increased melting of Greenland glaciers could affect this “conveyor” in such a way that the Gulf Stream would stop, thus giving the UK the same climate as Alaska within the next twenty years, i.e by 2023. That is utter balderdash. The Gulf Stream can’t stop. Evidence shows that the clockwise circulation of warm water has not stopped once in at least the past 30,000 years. Having said that, I’ll explain later about how a sudden change in climate affecting NW Europe may occur soon due to the bi-stable nature of the North Atlantic current system. Horizon had become a sensationalist programme, not really worth watching, long before this edition. However, in this case, it seemed to me that much of the blame could be laid at the door of the scientists themselves. Of course, this could all be due to the film-makers taking things out of context but it’s hard for me to believe that, given some of the claims made during the programme. Prof Richard Alley found from Greenland ice cores that “temperatures could drop suddenly and catastrophically” and said that “This flabbergasted us, I think this flabbergasted a lot of people.” OK, count me as one of the unflabbergasted. Why? Because I’d discovered this over thirty years before the programme was first broadcast. How? By studying gases or heavy water in ice cores, foraminifera in cores from the ocean bed? No. I read it in a book. I confess it; I’m lazy and will always take the easy way out if I see one. The book wot I read. Unfortunately, I can’t remember the name of the book that I read in the late sixties. I think it was one that dealt with different types of ice and their properties. In one section, the author explained why ice was slippery and that it was not due to the commonly-held theory that pressure on the ice melted it and produced a lubricating layer of water. Instead, he explained how the molecular structure of the ice at its surface was responsible. I noticed an item in last year’s New Scientist that this has been discovered again. In the book, the author explained how the current system in the North Atlantic is bi-stable, meaning that it has two stable states and can flip suddenly from one to the other. Once it has flipped, it will remain in the new state for a long time. He likened a bi-stable nature to that of a pencil standing on end; if no external force acts on it, it will remain in that position but, if nudged, it will fall onto its side. I’m not sure whether this is a perfect analogy for the North Atlantic as the force required to move the pencil from its new stable state to its original one is much less than that required to displace it in the first place. I suppose that could be true for the North Atlantic and that one current system only requires a little nudge to flip it but a larger force is required to tip it back. 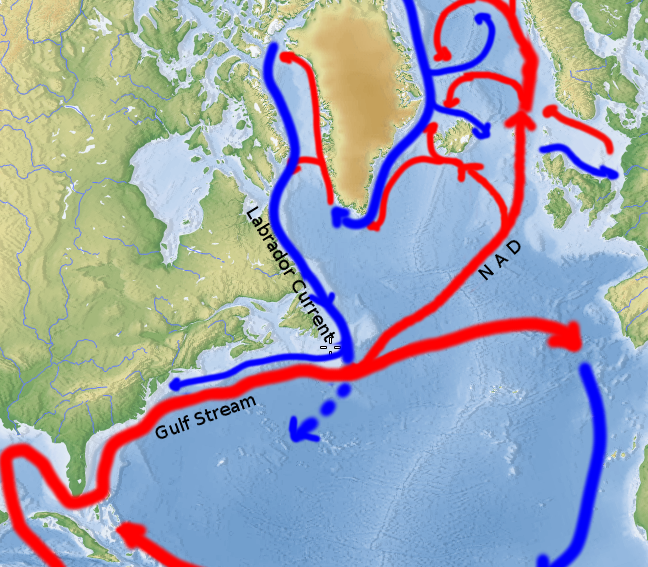 The discovery related in the anonymous book was that the North Atlantic Drift (NAD) can suddenly switch from being a warm current breaking off from the Gulf Stream circulation to a cold one sourced by the Labrador Current. The author explained that these flips to a cold NAD were correlated to sudden changes to a cold climate in NW Europe. He did not know what caused the NAD to flip but thought it might be due to a slowing of the Gulf Stream, perhaps as a result of a weakening of the sub-tropical high. The one good point about the Horizon programme was that a solution to the above problem seemed to have been provided, namely that of a weakening or cessation of the deep conveyor due to increased melting of the Greenland ice cap and consequent lowering of salinity. This would then lead to the slowing of the Gulf Stream and the subsequent failure of the NAD to reach escape velocity and its replacement by an extension of the Labrador Current. However, a couple of weeks ago, a doubt about all this suddenly popped into my mind. I didn’t really buy into the idea of the warm NAD suddenly stopping due to a slowing of the Gulf Stream and, I suppose that deep down, I’d always had a nagging unease about it. Along with the doubt springing to mind, came a possible alternative explanation which, if true, would explain how the NAD can suddenly flip. The chart below shows the present current circulation [tempted to write “current current” there] with a warm North Atlantic Drift (NAD) breaking off from the Gulf Stream circulation and passing by to the west of the UK, helping to keep the country relatively warm, considering the latitude. Now, another problem I had with the Horizon programme was the location specified for the sinking of the warm water to provide the source for the conveyor. As I recall, the map showed the main warm water sink occurring to the south of Iceland but that went against all I’d learnt some thirty-five years earlier. As I recall it, there was one sink in the gyre NE of Iceland and another probable one, perhaps two, in gyre(s) north of Jan Mayen. The map in the Wikipedia article here https://en.wikipedia.org/wiki/Thermohaline_circulation although idealised, I think is a little closer to the mark although it shows a sink off Labrador as being for warm water. As I remember it, the main sink in that area is a cold-water one where the cold Labrador Current sinks below the Gulf Stream, as I’ve indicated on the following map. North Atlantic Ocean Currents, version 1. Now, how do the sinks behave differently? Who is the densest of them all? For those east of Greenland and others further north, the warm water is more saline than the cold water. Although the temperature difference acts in the opposite way, making the density of the warm water somewhat less than it would have been without that difference, it’s still insufficient to make it lighter than the cold water so it sinks below it. There is also some mixing occurring in the gyres so heat and salt is exchanged and some cold water also sinks. The situation off the Grand Banks is somewhat different. Here, the although the cold water of the Labrador Current is less saline than the Gulf Stream, the temperature contrast is greater and is sufficient to make the warm water lighter than the cold, hence the Labrador Current largely sinks off the Banks beneath the Gulf Stream. Another consideration is that the Labrador Current has travelled a long way from its Greenland source and has its salinity level raised through an admixture with saltier currents. There are several causes of ocean currents, including the wind, but the one I want to consider here are density currents. Where adjacent waters have different densities, the sea surface of that with the lower density is higher than the other. Thus water flows downhill from low density to high. However, the Coriolis effect takes hold and the water is turned to the right so that a current flows parallel to the density contours. In the case of the Gulf Stream, the strong current near the boundary with the cold, south-flowing extension of the Labrador Current is due mainly to the density component. So what happens when the salinity of the Labrador Current decreases due to increased melt from Greenland’s icy mountains? I would expect the density component of the Gulf Stream to weaken as the density contrast weakens. But what else? Could the lowering in salinity of the Labrador current be sufficient to reverse the density contrast? I suspect this may be happening north of the Grand Banks where the temperature contrast is lower and hence makes a lower contribution to the density. It may be possible that the cold pool in the Atlantic is a sign that some Labrador water is now flowing over the warmer waters to the east. If the change in salinity goes further and the density of the Labrador current becomes less than that of the Gulf Stream, the flip could occur where the old NAD sinks below the Labrador Current and then turns south to join the THC. Meanwhile, the Labrador Current sails eastwards on the surface, swapping places with the NAD. The map below is my idea as to how the new situation [well, not exactly new as it’s happened before] will look. I confess the route of the submarine NAD is pure guesswork and chosen mainly to make the map somewhat clearer. North Atlantic Ocean Currents, version 2. I think my light-bulb moment a couple of weeks ago explains how the NAD can suddenly cease and a wholesale change in surface currents can occur, but then I would, wouldn’t I? The big problem is that I don’t have the data to calculate whether the theory is tenable; I leave that to the readers – if any. The one obvious thanks I have are to the author of the book I read so long ago. I can’t remember his name or the name of the book. I think he was an oceanographer at Woods Hole and that the book – a light blue soft-back – was published in the early sixties. 3 Comments on "Bi-stable Nature of North Atlantic Ocean Currents"
I’m fairly certain that the Met Office library will have that book. You can check what they’ve got online as far as I know. I tried to find it years ago but there was nothing like it. It may never have got into the library as it was located in the Marine Division (Met O 1) and may have been kept there or gone walkabout after the various re-organisations. Several things I know existed in the library and archives are now no longer there, some having gone missing in the last decade. For instance, monthly ice charts (A4 paper) went missing although originals survived, and a search on The Marine Observer reveals nothing – I got more luck on Amazon!